Yesterday a friend gave me a bunya nut cone from the bunya pine (Araucaria bidwillii) in the paddock next to their house. These things are huge! This isn’t even a big cone, but it weighs several kilos, is covered in sharp spikes, and is bigger than your head. 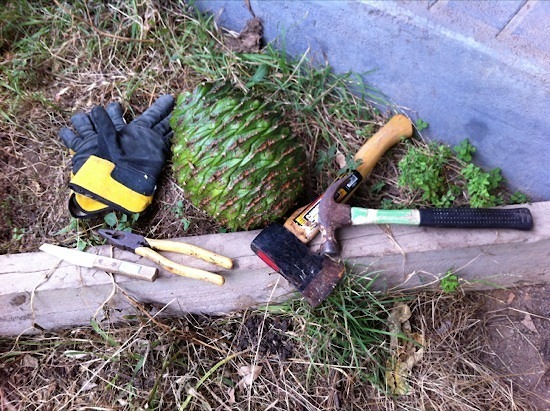 You wouldn’t want to pitch a tent under a bunya pine in a storm! Just smash it open with the hatchet or a blockbuster. Or smash it on a rock. 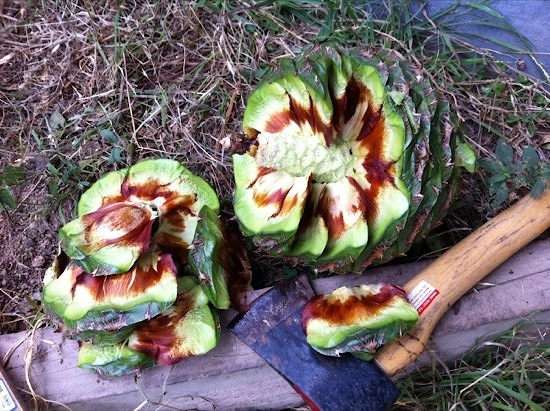 The idea is to break the cone down to the individual husks, most of which will contain a nut. The husks are a little tricky to open, but if you start at the pointy end and tear them you should be OK. Inside, you’ll find a raw bunya nut. They’re pretty big – roughly the size of a large avocado seed. 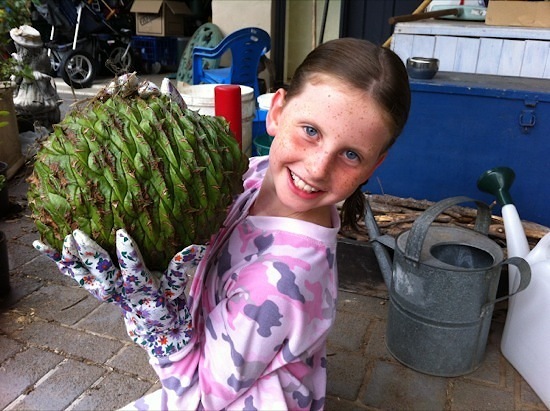 We got about 35-40 bunya nuts out of our cone, but really large ones are said to contain up to a hundred! 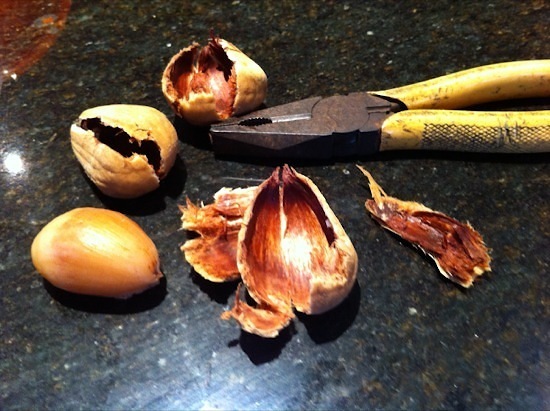 First, you need to carefully split the end of each nut to stop it from exploding when you cook it (a bit like chestnuts). 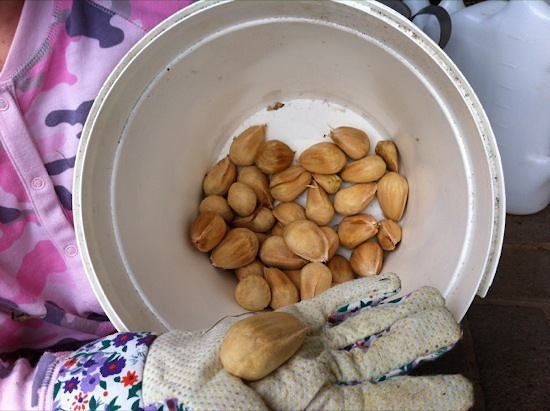 There are two main ways to cook the nuts – you can boil them in salted water for half an hour, or roast them in a 200 C oven for half an hour. We did half the nuts each way just to experiment. After cooking, you crack open the shells and remove the soft insides – again, a lot like removing the meat from a chestnut. 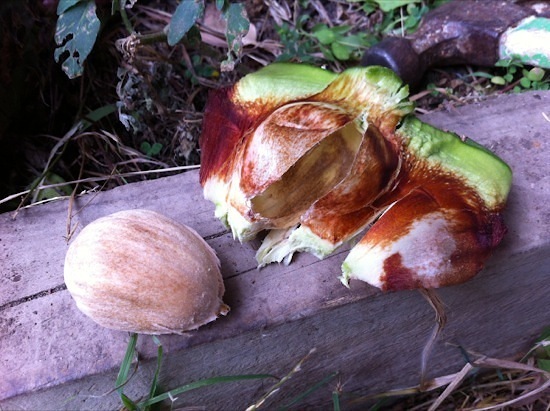 Bunya nut shells are pretty hard and tough, though, so it takes a bit of effort. Pliers help! It takes a little while, but you soon get the hang of it. And then you have a container full of beautiful cooked bunya nuts to work with! Of course, a lot tend to disappear during this final stage of processing :-). We really enjoyed eating the bunya nuts just like this – they taste like little floury potatoes with a nutty flavour. A bit like Jerusalem artichokes. As for potatoes, the roasted ones had a better flavour than the boiled ones. I reckon they’d be a great side dish served hot, tossed in salt and butter. Some people make pesto from them (replacing the pine nuts), and they’d be nice in a soup or stew as well. 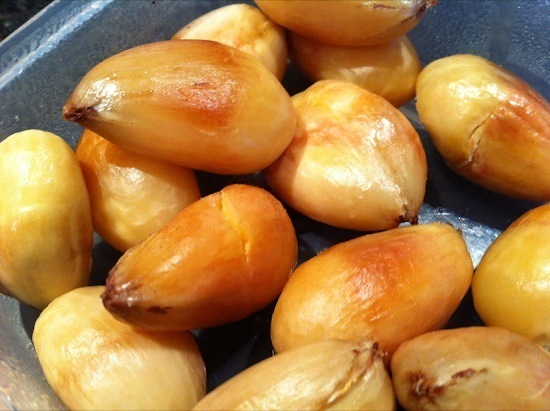 Next time I have the opportunity, I’d like to try roasting bunya nuts on a campfire – people say the smoky flavour really complements them. 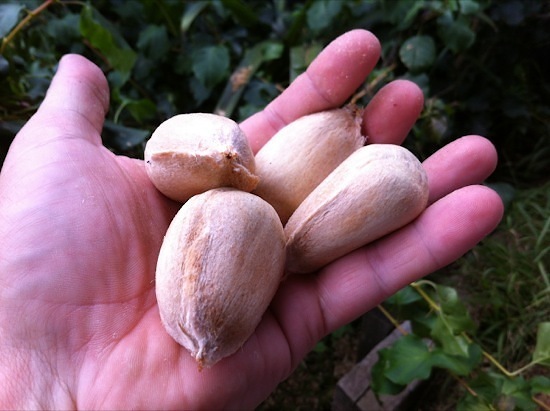 Have you tried eating bunya nuts? What did you think? Any recipes to share? Thanks! I bought one last weekend and wasn’t sure how to eat it yet! @Farmer Liz: Awesome, great timing! I’m very interested to know what you think, and what you make with them. We processed about 30 cones last weekend. We had so many nuts I ended up selling 25 kgs at the BOGI meeting this week. I plan to try and make a bunya nut cake tomorrow. We’ll see how that turns out. So glad you got to enjoy some Bunya nuts Darren – they’re great aren’t they!